Home Unlabelled Massive Recall Issued For Contaminated Canned Tuna! 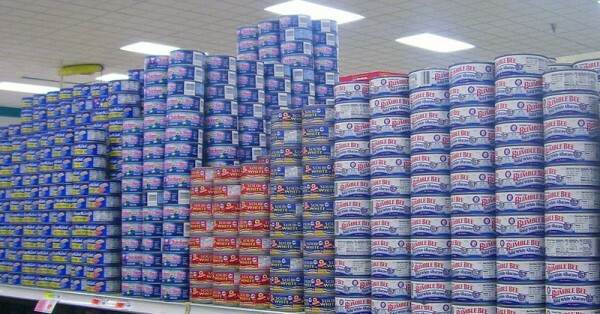 Massive Recall Issued For Contaminated Canned Tuna! If you buy canned tuna, you’ll want to take a close look into your pantry at home. A total of 31,579 cases of canned tuna fish were recalled after being produced in February 2016 and distributed all over the country. Bumble Bee, the popular canned tuna company, announced a voluntary recall of their Chunk Light Tuna due to a serious health issue. The company admitted to packaging the product in a facility that was not owned or operated by Bumble Bee. The packaging location could have resulted in contamination through spoilage or pathogens. If the product is in fact contaminated and consumed, the result could be life-threatening illnesses. No illnesses from the canned tuna have been reported as of yet. The company’s voluntary recall could keep consumers from becoming sick. If you have cans of Bumble Bee Chunk Light Tuna in your pantry, check them as soon as possible before anyone in your household gets sick. Bumble Bee is working closely with the FDA and the co-packer responsible for the outside packaging to remove the product from grocery store shelves. The company encourages consumers to check their products as soon as possible and dispose of any cans that may be contaminated. They issued the following statement, “Under-processed affected products could result in product contamination by spoilage organisms or pathogens and lead to serious illness if consumed. While we’re on the subject, if you are a regular consumer of canned tuna, there’s a few things you should know. Nearly all seafood contains traces of mercury, but the question is, at what level does it become toxic? It may be safe for you to eat canned tuna every day, or it may not be. Dr. Michael Gochfeld, M.D., Ph.D, researcher with the Environmental and Occupational Health Sciences Institute explained why the issue is complicated. Every person’s individual weight and their sensitivity to mercury would have to be taken into account, along with the type of tuna and how much of a risk they’re willing to take. Mercury poisoning is absolutely real and it can happen to you. Bisphenol A has been used for years in plastic bottles and canned food liners. It has recently been restricted in Canada and in some U.S. states due to potential health effects. When the Environmental Working Group analyzed 252 canned food brands, they found that 78 brands still use BPA-based epoxy lining in their products. BPA has been linked to a variety of fertility problems in both men and women, and it’s believed to greatly disrupt the body’s hormones. There are companies out there who have pledged to go BPA-free, but if you’re buying canned food, always do your research and make sure you have the facts.